The Integral has been specifically designed to snap into the side frame of your AMDOR® roll-up door. 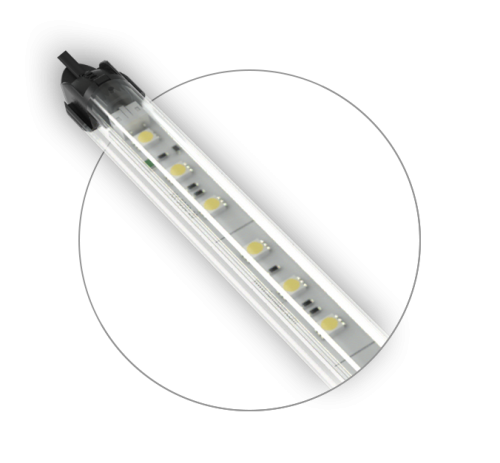 This helps to provide compartment lighting in a convenient, low-power, space-saving format. The Integral also features the Luma Bar® patented variable aiming system, giving you the flexibility to direct light wherever you need it most. Encased in a high-impact polycarbonate enclosure and with an IP67 waterproof rating, the Integral LED light is a robust product that can withstand the daily demands of life on the road. Standard lengths are available, as well as custom lengths to suit your door size, or any other application. In addition to the standard clear white lens, red and blue lenses are available. Alternatively, Integral can be ordered as a combination of red and white or blue and white lenses. Also included is the Luma Bar® current limiting device, which will shut off in the event of an electrical surge, and then resume once normal operating conditions are met. Both 12v and 24v models are available. Integrated lighting for vehicle roll-up doors.